Italy, in a historical sense, constitutes the Italian peninsula from the Alps in the North to the ‘toe’ of the boot in the South, a well as the islands of Corsica, Sardinia and Sicily. After the fall of the Roman Empire, the Italian region was heavily fractured, and it was from these fractured states that much of Italian-based HEMA comes. Confusion can easily arise though. In the 9th century, most of modern day Italy, France and Germany was under the rule of one man- Charlemagne. He was a Frankish warlord who, quite reluctantly, was proclaimed Holy Roman Emperor in the year 800. With the Pope’s personal blessing, Charlemagne was supposed to be the new unifying force of the West. The Byzantines of the East, who had retaken the South of Italy in the 6th century after the Western Empire’s collapse in 476, were not thrilled with the declaration. How could a barbarian be an Emperor? Just as Charlemagne was reluctant to be an Emperor, the Byzantines were just as reluctant to acknowledge him as one. Charlemagne’s empire was not to endure, and from its collapse came three vague political units, those being France, Italy and Germany. Where one ends and one begins can be tricky to pin down, but in short, ride until you can’t understand what the locals are saying and you would know you’ve left your borders. In theory, the Holy Roman Emperor was also the King of Italy and able to grant titles over land. Example, the Holy Roman Emperor Frederick III granted the leader of the city Ferrara, Borso of the d’Este family, the title of Duke in 1452, a Roman term derived from the word Dux. Why was it good to be a Duke? A Duke was almost on par with a king and about as high in station as a noble family could get without usurping the king o marrying directly into his family. Dukes could conquer land, expand their territory, create fiefs and do all the things a king could do, just on a smaller scale. Titles dispensed by the Holy Roman Emperor were known as Imperial in nature. There were Imperial Dukes, Marquis, knights and more. In theory, these Imperial men served the Emperor. Reality, however; dictated otherwise. Service to the Emperor was nominal at best. The Holy Roman Emperor rarely traveled over the Alps, and usually just to be crowned Emperor and King of Italy, only to leave in a hurry. Imperial power was not non-existent, but it was certainly weak in Italy and found in the North, close to the Alps. The lax hand of the Empire was preferred by the various feudal lords of northern Italy and would remain the status quo until the 16th century. Overall, Northern Italy was fractured into many states, of mixed governments. Florence, for example, had Republican rule, followed by a defacto dictatorship, followed by a Republic, followed by Papal rule. Venice maintained its Republic, while Milan was a duchy, with various mercenary commanders, such as the Visconti and Sforza, usurping the title of Duke. Smaller states, like Pisa and Ferrara, were continually under threat from larger ones. These Northern sates were wealthy, tremendously so, and this helped fuel the Renaissance. The center of the Italian peninsula was dominated by the Pope. The Papacy had its own lands and could also grant titles and fiefs in the same manner as the Holy Roman Emperor. Borso who the Emperor made a Duke, for example, was also confirmed as Duke by the Pope. Clearly he was a man wanting the favors of many! Tensions between Papal authority and Imperial authority had started with the crowning of the first Emperor, Charlemagne. Did the Emperor, with the army, have power, or did the man who crowned him have it? The Emperors clearly felt one way and the Popes another. Papal stability was difficult to maintain. Popes were often old men who lived relatively short lives. Upon a Pope’s death, the Cardinals would meet and elect an new one. Each death brought about new intrigues and contention, at one point leading to there being three Popes, and a Papacy based out of Avignon France rather than Rome. In the early 16th century, the Spanish Pope, Rodrigo Borgia, did all in his power to encourage his illegitimate son Cesare to kick out the various lords of the Papal states and make a Duchy for himself. Upon the Borgia Pope's death, Urban II undid all that the Borgia had wrought and attempted Papal expansion, and upon his death, that expansion was undone. Instability seemed inherent with central Italy as each Pope brought about drastic policy changes. Italians believed that, eventually, Italy was faced with two options. Dominion under a very lax Imperial hand or more direct rule over a robust, if unstable, Papacy. Those supporting the Imperial faction were called Ghibellines and those who favored the Pope were Guelphs. In the toxic environment of Italy’s politics, both factions could be found intermingled among the populace of Northern Italy and street-riots and open war was not unheard of. The dukes, marquis, lords and Republics of Italy often had to play a complicated game of supporting one faction and then the other in order to stay in power. In general, the nobility favored Imperial rule and the merchant class favored Papal. South of Rome was a more rural countryside, less populated and less wealthy than the north, though the city of Naples boasted a large population, one of the highest in Europe in the 16th century. The city of Naples dominated the South and was under disputed rule. In the 1400s and 1500s a Spanish line sat on the throne of Naples, followed by a French one, with the Papacy trying to claim, or at least heavily influence, the region. Disputed rule would ultimately lead to French, Spanish and German intervention in the peninsula. The Italian landscape was a place of contradictions. It had wealth and education, a sense of self, yet was riven with bloodshed, war and political crisis. For all its culture, the cities were rife with crime and the murder rate in the larger cities was roughly double that of the most dangerous cities in the United States today- with populations under 50,000. In Rome, for example, nearly everyone would have known someone who had been murdered, and nearly everyone was likely complicit in one in some fashion, from turning a blind eye, to disposing of bodies, to a knife in the dark. As rich and cultured as the people of Italy were in the 1400s and 1500s, and they boasted of this, they were also riddled with crime and a vast disparity in wealth. Vendettas between the ruling families was ongoing and murderous. So deadly were these familial struggles that opposing factions built miniature fortresses within the cities they resided in. The Orsini and Colonna of Rome, the Medici and Pazzi of Florence and the Bentivoglio and Canetoli of Ferrara. It was the very stuff of Shakespeare's Romeo and Juliet. The interconnections of Italy was profound, with the city-states using ambassadors in one another's cities to represent their interests. Machiavelli on behalf of the Republic was sent all over Italy and as far away as France. A sophisticated postal system, using riding stations, allowed letters to be quickly passed back and forth, and many a letter sent to Machiavelli was the government begging for more news, while Machiavelli begged for basic supplies! There was a sense that everyone knew each other, or at least, of each other. Using, very, very broad terms the Renaissance in Italy sprung from Florence around 1300 with forerunners such as Giotto, and Petrarch, and persisted into the 1500s. 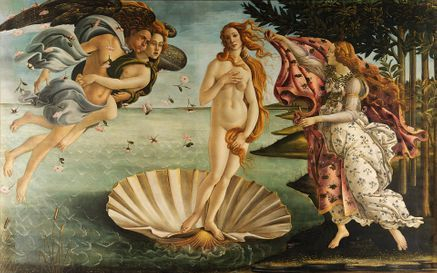 Historians today argue as much about the term Renaissance as they do its starting and ending dates. However, the Italians from this time recognized that they were living in extraordinary times. Italian Humanists in the late 1400s recognized Giotto as the start of something new and grand and the Italians of the 1500s recognized themselves as living in a Golden Era of rebirth. Florentine historian and humanist, Mateo Palmieri said of Giotto that before him, painting was laughable and crude, and after, he had set the groundwork for a restoration and even surpassing of the lost ancients. Time and again, writers from the 15th century noted they were entering the ‘light’ of a new age, one matching and surpassing antiquity. The Italians never forgot their Roman roots, nor past Roman glories, but as one Florentine writer put it, they put the prior Golden age of antiquity to shame because man knew no limits. An age of arrogance might be another way to describe the era. In short, while modern historians may debate the time and place of the Renaissance, the contemporaries were more sure of themselves. They were also aware and vocal about the concept of Italy. No, there was no unified Italy, but there was 'an Italy'. Italy had no unified government, no standard language (even cities had their own dialect), and no end in sight to the petty squabbles between the various states, and yet, people knew what Italy was and was not. Borders were not defined and castles and fiefs and towns traded hands frequently, both through war, reward, and inheritance. Yet, the people of the 15th and 16th century knew what Italy was and were aware of the vague three pieces the country could be divided into, the wealthy North, papal middle and feudal South. Pope Urban II and Machiavelli both referred to ‘their country’ and referenced ‘barbarians’ in the form of the French, Spanish and Germans. The two also longed for a unified Italy, with Machiavelli looking for a capable Duke, similar to Cesare Borgia who he was fascinated by, while Julius III perceived himself as a warrior-king destined to rule Italy, more at home with a sword in his hand than a Bible. It is in this Italian Renaissance, as called by contemporaries then and historians today, that some of the earliest documented Historical European Martial Arts can be found. Fiore de Liberi was the son of Free Knight (an Imperial title) and himself may have been one. He was, by his own account, a fencing-master writing to the court of Niccolo III of the d’Estee. In Fiore’s day, Niccolo was a Marquis, and it would be his illegitimate son, Borso, that would inherit the ultimate title of Duke, from both Emperor and Pope. Fiore was from the generation after Petrarch, father of Humanism, and Giotto, famed for his elevating of the arts to a worthy field to be emulated and surpassed. He was the contemporary of Ghiberti, who crafted famous doors in Florence, and Brunelleschi, who, likely just after Fiore’s death, began work on the creation of the largest free standing dome in the world, the Duomo. Fiore, at the time of his writing in 1410, noted he had fifty years of experience, indicating he was likely born sometime around the mid 14th century and he would die in the early 15th. He learned from Germans and Italians and visited the courts of Princes, Dukes, Marquesses, Counts, Knights and Squires and cites Master Johane, called 'Suveno' as his teacher, and 'Suveno's teacher being Nicholai Toblem (alas nothing is known of either). While Fiore certainly valued his teachers, he also claims to have discovered some of the techniques within his treatise- though he does not specifically say which ones, only that all of his techniques he had seen in action, or had tested himself. Though born in Friuli in Northern Italy, Fiore was very much the traveling man, finding work and moving on, never situated in one place for too long based on what little we know of him. Where work was to be had, Fiore went. His teachings were written down and illustrated and four surviving copies exist in what is called the Flower of Battle-, the Getty, Morgan, Pisani-Dossi and Paris. The introduction and instructions are either in Italian, verse or otherwise, or, in Latin prose in what was becoming a trend in Italy and part and parcel of the Renaissance. Fiore’s world was one of violence. The contentions between the various city-states was unending, though in Fiore’s day, the French, Spanish and Germans had yet to directly intervene. Instead, Italy had foreign intervention of an unusual sort. The Hundred Years War between France and England had reached, what contemporaries thought, was an end. In reality, it was just a pause. The French King had been captured at the Battle of Poitiers and this ended hostilities. The soldiers on both sides, many of them mercenaries, were told to pack up and go home. Instead, they devolved into banditry. Large companies of bandits formed, and referred to themselves as mercenaries, though at the time they seemed to work entirely for themselves. These companies coalesced into a grand company that besieged, of all people, the Pope who was living in Avignon France. These mercenaries were paid by the Pope to leave France and head East, for warmer climates and endless work in Italy. A horde of mercenary companies, including the German Sterz and Englishman Hawkwood set out in 1361 and arrived in Italy when Fiore would have been in his formative years, learning to be a master of all weapons. Fiore notes in his introduction that he learned by traveling and met many German and Italian masters. He no doubt would have been well-aware of the foreign mercenaries who had flooded Italy and the famous John Hawkwood. For all his life, Fiore was never far from the mercenary life and would have been well aware of the luminaries of his day, because he sometimes worked for them. The mercenaries were known as condottieri, the word stemming from the word for contract. Large mercenary companies were made up of smaller and even individual contracts. The head of the company then signed rather detailed contracts with their employer. The contracts covered not only pay, but also, where the mercenaries were to camp, what duties they would and would not do, and even what sort of funeral expenses the mercenary commander might expect. Top condottieri could expect not only riches, but if fortunate, they could ride themselves into possession of one of the city-states, like the Sforza family, or if unfortunate, they might be executed, as was the fate of Hawkwood's original commander, Albert Sterz. After switching sides in numerous wars, he contracted with the Perugians, only to be accused (given his track record perhaps for good reason) of treason and beheaded in 1366. Fiore was likely to know of this event given Sterz's reputation and Fiore's familiarity with mercenaries. Fiore would find himself in Perugia twenty years later as the fencing master of a dueling knight. In 1384 he raised a mercenary company for Udine, and later was tasked with keeping the peace within a portion of the city. Fiore's works, the Flower of Battle, were created for Niccolo III of the d'Este family. The Getty and Morgan versions speak to the wealth of the patron, with the use of actual gold and silver in the pages, while the Paris version, has full-color. They are all products of the budding, early Renaissance, with the imagery depicting detail, life-like positions and in some cases clear perspective. Niccolo was the Marquis of Ferrara, a man who ruled the city with an iron-fist and was willing to sell out the services of his army, with him at its head. While Fiore's works are dedicated to the d'Este, it is unclear if Fiore was a member of the court, paid by the Marquis, or perhaps in the service of another city and at their behest (and for their coin) making a gift to the master of Ferrara. At the age of 27 when the Flower of Battle was written, the Marquis of Ferrara was not particularly known as a man of the arts, but of war. Yet, Fiore's subject matter would have specifically appealed to him. Niccolo, in 1425, had his son and wife executed for adultery with one another, which was a form of irony given the saying of the time was that Niccolo had many sons on either side of the Po (river)- having fathered numerous illegitimate children from numerous adulterous relations. For all his life he remained a military man, ready to lead the various Italian leagues- for a price. Fiore's Flower of Battle was to be a complete system, which he simply called 'the art' directed at the nobility, namely the d'Este family. Fiore's work was not for a complete novice, but rather for already experienced men. It was, as he put it, easy to learn, and so had to be kept a secret. While Fiore humbly submits he is no master, he then goes on to say if there were doctorate degrees for the art, he would have it, and that many other men from high and noble courts have valued his teachings. His list of students include knights and condottieri. The Flower of Battle may have been for a military man, but it is not exactly a battlefield treatise. The primary purpose of the work was to prepare its reader for a sanctioned duel for honor. Fiore states he fought five himself and came away unscathed, all without wearing armor, and that his students (who were wearing armor) came away pleased and rewarded him for his services. These duels of honor were spectator events. 12,000 attended the fight between Fiore's student Galeazzo Gonzaga and the French Jean Le Maingre. The cause of the duel was an insult toward Italian knighthood that Galeazzo answered. These sanctioned duels were costly affairs for the host, but largely safe for the participants. Before the one between Galeazzo and Boucicaut (the name Jean went by) became too serious, the Lord of Padua threw down his rod, ending the duel with neither being declared the winner. They would meet again in a duel, and again neither would be harmed, though Galeazzo would come away the victor. Galeazzo met his end in his capacity as a condottieri, while Boucicaut was captured in 1415 at the battle of Agincourt and died in Yorkshire England as a prisoner six years later. While sanctioned duels of honor was a key portion of Fiore's Flower of Battle, there was more to his work. Fiore's world was one where assassination was common place, especially among the elite. Lords with too many sons, Pope's with deep ambitions, jealous siblings and rival families preyed on one another. Fiore goes so far as to show a man, seated, holding a baton of office being attacked by a dagger-wielding assailant. Fiore's work was universal in a sense, in that while it functioned in the setting of a duel, it also was readily applicable to self-defense. In another section, he shows a man with a walking staff and dagger fending off a spearman, in what may be some road-side encounter. Skirmishing also appears to be a piece of Fiore's work, as in the mounted section he shows how best to stab a fleeing opponent under their arm, or how to dissuade a chasing foe. Fiore was also not above outright trickery, giving the ingredients of blinding powder, and the use of an entangling rope, for pole-axes. Such hidden, unusual weapons were perhaps looked down upon by the rest of Europe, but if the 16th century writer Brantome is to be believed, the Italians took a particular joy in such deceptions just as much as they did techniques. Overall, the Flower of Battle covers the use of many weapons including, no weapon at all, dagger, the sword in one hand, two, the spear, the pole-axe, armored combat and mounted. 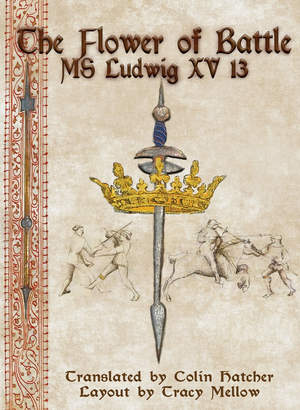 Fiore's legacy is unusual, in that the comparable longsword source, Kunst des Fechtens, KDF, derived from the Zettel of Liechtenauer, followed a very different path. The German tradition was carried on by an entire Fellowship of masters, and from there morphed into guilds, where the teaching of arms was very much a city-affair and regulated. This led to a rich tradition, starting with the Zettel, circa 1380 and ending with Meyer's treatise (arguably) in 1570. Fiore has no such lineage or success. His art was, after all, a secret, taught verbally and only put to paper late in life. The d'Este family did nothing with it and there are no masters that follow Fiore that mention him by name. While KDF was directed, ultimately, at the urbane masses, Fiore's work was meant to be the secret art of princes and kings and it is likely that there it remained. That does not mean there is nothing though. In the 1420s a German work appeared, Codex 5278, that has imagery similar to Fiore's work- though not identical and without explanation. The relationship to Fiore (if any) remains unknown. 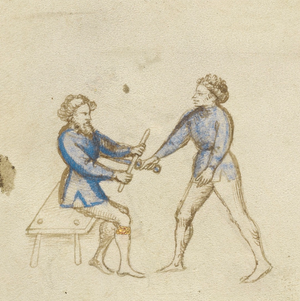 In the 1480s, half-a-century after Fiore's work was crafted, the fencing-master Philippo Vadi put forth a treatise of his own that took sections of Fiore and re-purposed it. Vadi does not mention Fiore by name, but does claim to be creating a new art, one of science, to replace an older one- the 'art' of the ancients. Vadi was not alone in seeking to alter existing swordsmanship, seen as too open, free and artistic, and replacing it with the more sure, accurate and trustworthy, though somewhat mystically treated, science of his era. This science over art argument would be a mainstay in 16th century literature, including the work of Agrippa, whose modern 'science' of fencing was to replace the 'art' of old and would indeed spawn a style of fencing with the rapier that would dominate Europe. In the early 1500s Ludwig von Eyb created a treatise that also appears to be influenced by FIore's artwork, but the exact connection is unknown. Today, modern members of the HEMA movement still practice, translate and interpret Fiore's work. Fiore died, likely, between 1410 and 1420 -most likely in Italy, although one of his manuscripts did eventually wind its way into the Bibliothèque nationale de France. Two ended up in US museums, the Getty in California and the Morgan in New York, while the Pisani-Dossi remains within the family vaults of an Italian noble family of the same name. 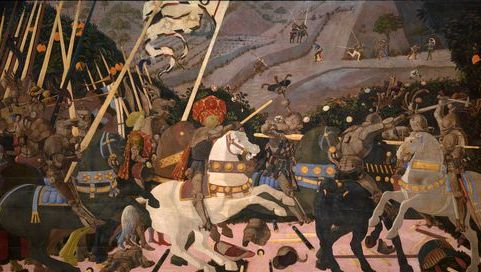 The Flower of Battle was dedicated to Niccolo III d'Este, who died in 1441, leaving Ferrara to one son, Leonello a patron of the arts, and after his death, Ferrara came into the hands of Borso, who would be elevated to Duke by both Emperor and Pope. the d'Este family would remain Dukes of Ferrara and allow the Borgia family to marry into their own. The main line of the family died out in the 1500s and the Pope took Ferrara for himself by force. Italy's wealth did not mean they had military power. The fractured states learned quickly that alone, they could not face France, Spain or the Holy Roman Empire. With the death of the King of Naples as pretext, the French invaded. Divided Italians both hindered and helped the French. Spain, became embroiled for the same territory and when the Holy Roman Emperor, Charles V, was also the King of Spain, that guaranteed German interests in Italy as well. Not until the 1860s would Italy be unified, and in the meantime was often a battleground between larger states, such as the French and Austrians. If you want to learn more about Fiore, consider Colin Hatcher's The Flower of Battle, a fresh translation done in the same style as the original. 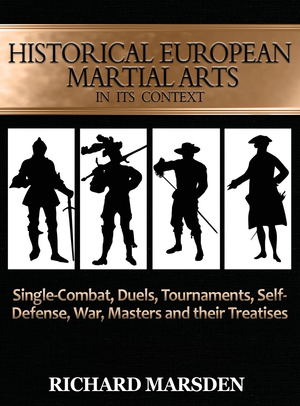 The history behind the sources is included in my book, Historical European Martial Arts in its Context. Check it out!